With the Nov. 6 election looming, it’s time for Wabash to talk politics. Long-time Political Science Professor Dr. David Hadley will appear on Wabash’s First Friday Live this week to discuss the election. But First Friday Live is not just talking heads; it’s a chance for viewers of the live webcast to ask questions make comment during the live show. Hadley taught American Politics, Congress and the Presidency, state and local politics for 43 years at Wabash. He has led student groups numerous times to Washington D.C. and led efforts polling local voters during elections. 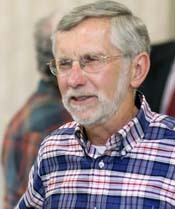 Hadley has been actively politically as a leader and candidate. Friday’s live chat will be a non-partisan look at this year’s races in Indiana and the Presidency. Just log on to First Friday Live at 12:15 Friday to join the conversation.